This beautiful villa has two individual apartments, which can be hired as a whole, which makes this villa ideal for a family or group of friends who want to enjoy the peace in an apartment that is provided with every comfort. 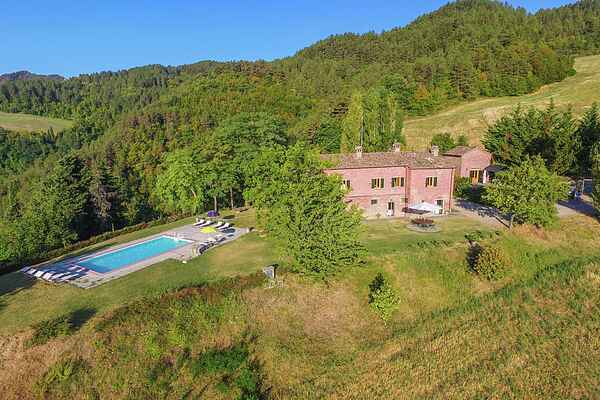 This villa is located in the midst of nature and has a beautiful view over the Apennines. The spacious living rooms are both provided with an open fireplace and comfortable sofas, the kitchens are fully furnished and there are beautiful large tables for nice meals. In total there are 7 bedrooms and 4 bathrooms. Next to the house there are two terraces where you can dine. The swimming pool is located next to the house and the guests of the mini-apartment next to the villa have use of it too. There is an authentic pizza oven present. There are many excursion options to cities such as Florence (art and renaissance), Faenza (ceramics) Ravenna (Byzantine mosaics), Rimini (Roman remains and important spa), Riccione and Milano Marittima (cosmopolitan resorts). All types of sports activities such as tennis, horseback riding and golf are in the immediate vicinity, and there are nature walks the minute you set foot out of the door. Ceramics and cooking courses are organized. If you are interested, please discuss this with the homeowner before arrival. We accept small and medium-sized dogs as long as they are educated. The cost for heating is to be paid locally, the reading of the gasmeter is made ​​when starting the heater ( before the arrival of the guests so that they find the house heated).